TORONTO, CANADA – September 12, 2017 – Today’s the day you’ve all been waiting for. 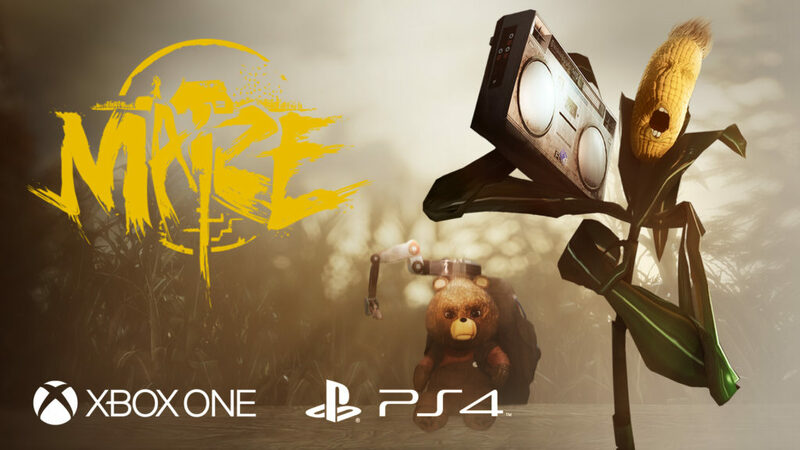 MAIZE, everybody’s favourite corn-fueled absurdist first-person puzzler adventure is back and it’s stalked its way onto PlayStation®4 and Xbox One! To celebrate this exciting scientific achievement, we managed to nab Finish Line Games and Vladdy, one of MAIZE’s colourful cast of characters, for their thoughts on the launch. Vladdy: You mean hero. Vladdy is game hero. Finish Line Games: Well, technically the player’s the hero. Vladdy: Is player star in front of camera? NO. Does player have strong robot arm? NO. Player only walk around. Vladdy. Vladdy does all the talking. Vladdy is hero. Idiots. FLG: Uh… that’s not the definition of first-person. The player’s the one behind the camera. And now they’re moving with a controller. It’s safe to say they’re in control. Vladdy: Camera is always on Vladdy. But of course Vladdy very charming. Vladdy: Yes. This Vladdy’s story. Lazy console gamers on couch will laugh at idiot corn and cheer for Vladdy. They want to be Vladdy, but not even console allow that. Vladdy: Corn look silly. They are idiots. Vladdy: Vladdy work odd jobs on side to pay for world travels so Vladdy out of hair. Vladdy not even get royalty cheques! FLG: Yeah, maybe we can cut that last part. Probably not the best note to go out on. We do have a launch trailer, though. You should definitely check that out to get in the mood for some good old fashioned adventuring. MAIZE is available today on PlayStation®4 and Xbox One for $19.99 USD. As a limited time launch offer, PS+ and Xbox Gold Members can take advantage of 25% off their purchase of MAIZE for 2 weeks. MAIZE is also available now on PC through Steam, the Humble Store and GOG.